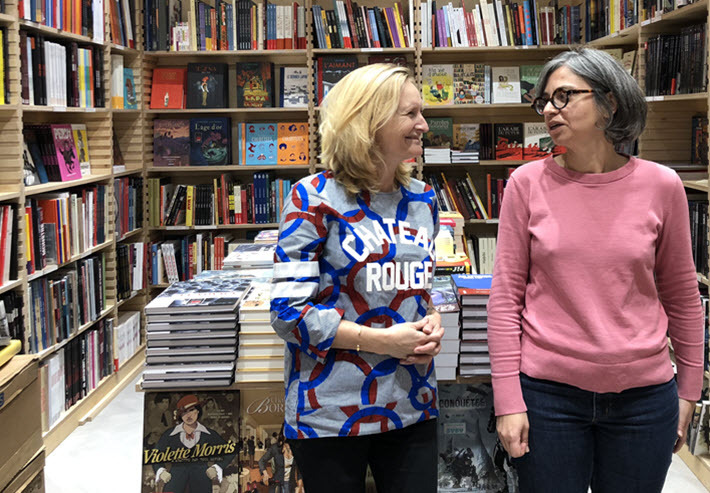 The co-owners of Paris’ newest independent bookstore say they’re convinced they can make a go of it, even as France’s market evolves. It’s not every day that a sizable independent bookshop with a café opens in Paris—or in any other capital, for that matter. ICI (which means “here,” in French) has opened today (October 26) on Paris’ Grands Boulevards, no less, the first great promenade created for the capital under Louis XIV. The two women at the helm are Anne-Laure Vial and Delphine Bouétard. The size of their enterprise befits its address. The store has 500 square meters of space, or 5,381 square feet, making it the largest independent bookshop in the city. Their starting inventory comprises some 40,000 books. And yet, Vial and Bouétard are serene while busy. Between the two of them they have years of experience under their belts, having worked in such roles as head of sales, chief buyer, head of marketing, and/or bookseller for companies including Volumen (now Editis); Amazon; the now defunct Virgin Megastore on the Champs Elysées where they met in 2006; FNAC, and Flammarion. Their experience may be helping them seem so assured when asked about statistics that show that between 2011 and 2014 there’s been a 9.9-percent decrease in the number of bookshops in Paris. Several high profile stores have indeed closed in the last 10 years, among them Virgin, La Hune, and even the much-loved English-language bookshop, the Village Voice. Virgin failed because of the collapse of the CD and DVD market, while La Hune simply couldn’t afford the rent in Saint-Germain-des-Prés. Trends show the Saint-Germain-des-Prés neighborhood and its surroundings, a traditional center for bookshops in Paris, becoming too expensive for bookshop owners, and most new bookshops now open on the Right Bank or toward the outskirts of Paris. One such store, Vial points out, is called Les Nouveautés, and is doing well, now two years in business. It was established following a five-year battle won by residents protesting a supermarket that was to open in the same location. What’s more, an English-language bookshop that had closed in the Marais district, The Red Wheelbarrow, is reopening in the pricey Latin Quarter. “I’m not so sure there are fewer and fewer bookshops,” says Vial. “They seem stable to me.” In her most recent role, she worked for six years with booksellers as clients, and she says she didn’t see any of their shops close. “The statistics are correct,” says Bouétard, “but you’d have to break down exactly what’s meant by bookshops—stationery stores with a few books, for example, are included in the category” when some statistical analyses are made. Small businesses selling newspapers and a few books may also have been included in studies, and some of those may have closed because of declining newspaper sales, writes Delphine Roucaute in Le Monde. In 2017, France’s National Publishing Union (SNE) has reported, sales of general literature were up by 2.7 percent, as were sales of comics, and health and wellness titles. They quit their jobs a year-and-a-half ago, and have since worked solely on this project. They say they looked carefully at real estate, aiming for a neighborhood in which there’s a lack of major bookstores. Paris’ Grands Boulevards are an evolving hodge-podge of tourist spots like the Musée Grévin wax museum, the Folies Bergères, and Le Grand Rex, Europe’s largest cinema. But the area is also home to 18th- and 19th-century covered passageways, numerous restaurants, and the nearby publishers Bragelonne and Allary Éditions. The building in which ICI is located is owned by the city of Paris. Vial and Bouétard say they negotiated a modest rent. They’re 50-50 partners and benefit from an interest-free loan plus subsidies from the Association pour le Développement de la Librairie de Créaton (ADELC) which helps bookshops; the Centre National du Livre (CNL); and the Drac Île-de-France, part of the ministry of culture’s programming. The ADELC has a 5-percent share in the investment, which will be returned once Vial and Bouétard have reimbursed their loan. They have a seven- and nine-year plan. Their partner for the café is Coutume, a Franco-Australian specialty coffee shop that’s installed on the ground floor with tables and a bar. Light fare and desserts are available. Literature, art books, noir, and science-fiction is sold on the ground floor, while other subjects—social sciences, cooking, tourism, wellness, education, graphic novels, and the children’s books section will be located in the store’s large, airy lower level. The bookcases, cabinets, and reading niches are adjustable, “so we can adapt to our readers and market trends,” says Bouétard. She says she’s seen too many bookshops confined by inflexible furniture design. Vial and Bouétard are busy setting up events with British authors, while confirmed speakers include Franco-British singer and actress Jane Birkin (Jane & Serge: A Family Album, Taschen, 2013), and journalist and philosopher Raphaël Glucksmann (Notre France, Allary, 2016). The two booksellers say they agree about most business decisions: “We come to the same conclusions even if we think in very different ways,” says Vial. For the moment, they’re sharing social media duties, Vial on Instagram and Bouétard on Twitter, but eventually they say they’ll add a community manager to their team of 10 employees. And the one subject they disagree on? Author Marguerite Duras. Vial likes her, Bouétard doesn’t. ICI is located at 25 Boulevard Poissonnière, 75002 Paris (Métro Grands Boulevards). More from Publishing Perspectives on bookselling is here. Many thanks for reading us, Sheida! Thank you so much Olivia for your interest to our bookstore and this great article. Hi, considering something similar on a much smaller scale, in a much smaller country and a much smaller town and just to make it a little more daunting, I am a 55 year old who has finally decided to do something that I should have tried to do a long time ago. Hopefully I will follow through on it. You have given me some further inspiration. I wish you every success with your Book Shop and hope to visit it one day.